Update: Sorry folks, it looks like we're going to have to wait a little longer before E.T phones home. The Russian lab that first heard the mysterious signal is now stating that "subsequent processing and analysis" has "revealed its most probable terrestrial origin." Yep, we'd been listening in on one of our own. Despite earlier hopes, the alien spotters can now state "with confidence that no sought-for signal has been detected yet." It has emerged that last year, at the RATAN-600 radio telescope in the far south of Russia, astronomers received a strange signal. It came from the direction of HD164595 - a star about 95 light years away from Earth in the constellation of Hercules. The star is almost exactly the same size as our Sun and we know it has at least one planet, possibly more. The signal itself was strong - strong enough that if it has been broadcast in all directions then it must have come from a Kardashev Type II civilisation. That number refers to the Kardashev scale - a method for measuring a civilisation's level of technological advancement. A type-II civilisation is far more advanced than ours. Alternatively, if the signal had been carefully aimed at Earth, then it isn't unrealistic it could have come from a type I civilisation - roughly equivalent to our own. News of the signal came through the Centauri Dreams website, which covers peer-reviewed research related to deep space exploration. "No one is claiming that this is the work of an extraterrestrial civilization, but it is certainly worth further study," wrote Paul Gilster, who runs the site. "But the signal is provocative enough that the RATAN-600 researchers are calling for permanent monitoring of this target." Alternative explanations include light from a bright stellar object being squeezed by a quirk of gravity as it passes another object in space, or testing by the Russian military. The noise was heard in a part of the spectrum known to be used by the military. 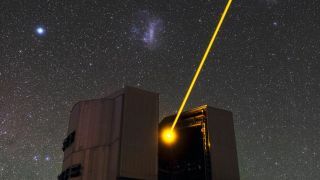 The SETI foundation, meanwhile, has turned its own telescope to the same source - though hasn't yet been able to find it. The search will, no doubt, continue.